Grace and peace to you from God our Father and our Saviour Jesus Christ! Today for our meditation we have a very important event from Jesus life. Very, very important. It is described in all four gospels. It marks the beginning of Jesus public ministry. Yes, we are talking about Jesus’ baptism. Isn’t this a bit confusing when we read about different baptisms in the New Testament? How many different baptism were there? There was John’s baptism. Meaning that John the Baptist was baptizing people. Then there was Jesus’ baptism, when Jesus was baptized by John, and God the Father and the Holy Spirit also were present. And then, of course, there is the Church’s baptism. The one which we have received. Why are there so many baptisms? How do they differ one from another? How are they important for us? This is what we’ll try to sort out today. Let’s begin with John’s baptism. Greek word for ‘baptism’ simply means to dip in water, to wash, to purify by means of washing. John didn’t invent the practice of baptizing with water. There were many similar rituals among the Jews and also in other religions. What was unique with John, what the reason why he baptized people. His was the baptism of repentance for the forgiveness of sins. John called people to repentance, to turn away from their sinful ways to the true God and to admit that they needed His forgiveness. When people come to John to get baptized, they repented of their sinfulness. They knew that we all will have to give an account to our Creator and that we can’t stand before the holy God on our own, we desperately need His forgiveness. In a way John still speaks to us. Repentance is what we all still need. Unless we recognize our sinfulness we won’t desire and appreciate God’s salvation given to us in Christ. Now, if John’s baptism was for sinner, who needed to repent of their sin, and who needed God’s forgiveness, why did Jesus come to be baptized by John? Was He a sinner? Did He need to repent? Did He need God’s forgiveness? None of these. In the gospel according to Matthew we can actually read how John objected, when Jesus came to be baptized by him. John knew very well that He was in need to be baptized by Jesus and not the other way around. But now, Jesus had come to him. Why? Remember, this was the beginning of Jesus public ministry. That far He hadn’t revealed Himself yet. Now He was standing together with sinners, with those who deserved God’s wrath and needed God’s forgiveness and was about to be baptized together with them. But Jesus not only stood among them, with His baptism He revealed the He actually stepped in their place. He stepped in our place. He, the holy Son of God, innocent and blameless, identified Himself with us sinners. He took our place. He receive the baptism of repentance on behalf of you. On behalf of fallen human creatures. John was shocked. How so?! The Christ was to come in the divine glory, not as a repentant sinner. And John was right, partly. This is what Christ will do. But not yet. This is what will happen at the end, but for now He came to begin God’s plan of salvation. This is where Jesus received the Holy Spirit, so that in the power of the Holy Spirit He could accomplish His mission. Whatever He will do from that moment on, His preaching, His healing, His resurrection, He will do all of this in the power of the Holy Spirit. It was God’s eternal Son, the second person of the Trinity who had come to save us. Besides it was not only Jesus, who was involved in this mysterious plan of salvation. We can see in this event what kind of God we have. The whole Trinity was and is involved in your salvation. Jesus was, indeed, the one about whom John had said that He will baptize with the Holy Spirit and with fire, who will come as God Almighty, but not yet. Something else had to be done before that. As Jesus identified Himself with us, with sinners, He set to receive what sinners justly deserve, – the fire of God’s wrath. We can say that as the fire of God’s wrath was poured over fallen and rebellious human creatures, Jesus became our umbrella, our shelter and shield. He Himself was baptized, first, with the Holy Spirit, and then with the fire of God’s wrath. And when His baptism was over, He rouse again to share with us what He had obtained. God’s forgiveness and eternal life. All that He did, He did also for you, so that today you could freely receive God’s gifts. Now we get to the third kind of baptism, our baptism. The Church’s baptism. The baptism in the name of the Father and the Son and the Holy Spirit. Remember, John’s baptism prepared people for the coming of their true Savior. In Jesus’ baptism the Son of God stepped into our place, to receive what the fallen humanity deserves. How does the Church’s baptism fit into God’s plan of salvation? This is how. When Jesus ascended to the heavens, He left here His body, that is – the Church. This is how the Church is identified in the New Testament. The body of Christ. You are this body of Christ. You all are members in Christ’s body. And to this body on the day of Pentecost Jesus gave the Holy Spirit. As Jesus stepped in the place of the fallen humanity, now He has left the Church in His place. Now we are Jesus body here on earth. 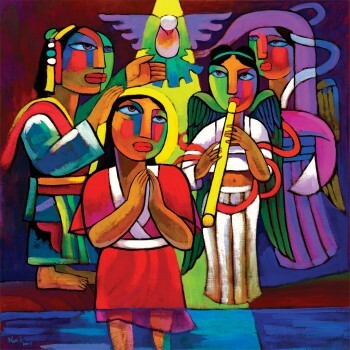 Before His ascension into the heavens, Jesus commanded to make disciples from all nations, baptizing them in God’s name and teaching them everything that He had commanded. This is where the Church’s baptism comes in. The Church’s baptism is nothing else, but Jesus making you a member of His own body, His Church. And when you are made a member of Jesus body, the Church, you receive everything that Jesus has received. As Jesus identified with us, sinners, now He identifies us, sinners, with Himself. In your baptism you are joined with Jesus. You are joined both to His death and to His resurrection. It means that if you are baptized, you have already received God’s wrath, and you have already receive the eternal life. It means that the Holy Spirit, that was given to Jesus, now is given to you. This is why we say in the Creed, that we believe in one, holy Christian Church and the communion of saints. It means that all Christians are one in the Holy Spirit. Our Christian communion is not communion of families, or of same interests, it is communion created by the Holy Spirit, where all God’s chosen people are made members of His body. This is what you are. It means that now God the Father looks at you and says: “You are my beloved child. With you I am well pleased.” When God the Father looks at you, He does not see your sins, your guilt and shame anymore, He sees only His beloved children. This is a mystery of God’s salvation. It is something much greater, much more intimate that we can imagine or understand. Our union with God is as intimate as the union between the eternal Father and His beloved Son. It’s not for us to comprehend it fully, at least not for now. We can only pray the Holy Spirit to enlighten us as we wait for Jesus’ return in His divine glory. There is so much more to be said about the Church’s baptism, however, we need to address also a terrible misunderstanding about baptism. You see, Jesus didn’t say ‘go and baptize people’. He didn’t say, go and baptize everyone. What He said was – make disciples! How? By baptizing, that is, by making them members of God’s family, the Church, and by teaching them everything [!] that He commanded us. Our responsibility is to make disciples, by baptizing and by teaching them everything that Jesus commanded. By baptizing you are adopted as God’s child and by teaching you grow in intimacy with the Triune God, with the Father and the Son and the Holy Spirit. You also grow is fellowship with other God’s children in His body, the Church. Your grow in your understanding of God’s will for your life, you learn what it means to be Jesus’ disciple and you learn how to bring other from darkness to light, from the power of Satan to the Kingdom of Christ. All of this happens in the Church. You can’t separate baptizing and teaching. There is no such a thing as baptizing people, who don’t want to be Jesus’ disciples. One doesn’t work without other. In baptism God Himself makes you member of His body, and all God’s blessings, all His promises belong to you. But how can any of these things benefit you if you leave the body of Christ, or if you don’t even want to join it, if your choose to live separated, to live apart from the body of Christ?! How can any member live without being attached to body? How can it receive life? It can’t. Can a branch exist apart of tree? It can’t. For it doesn’t receive life. How can anyone have true faith while ignoring or rejecting the Church, where the Holy Spirit and the Word of God creates and sustains our faith? No one can. If our rebellious heart leads us to love this world more that the Kingdom of God and to care more about our desires today, than about our salvation and eternal life, then our baptism doesn’t do us much good. Then we have rejected God’s grace. Jesus Christ, the Son of God became one of us, He took our place, He received God’s wrath on the cross, so that only He could grant us His forgiveness and eternal life. Let’s not treat it as something cheap. Let’s not treat the Church’s baptism as something that belong to us. It belongs to Jesus. And it has to be used according His instructions. So let’s be diligent learning all that Jesus has commanded, so that we can grow closer to our Father and His Son, and learn how to keep His commandments. Let us be diligent in teaching others what the Church’s baptism is, how Jesus obtained it, what it does and what it gives us, and how we can receive God’s gifts properly.